After discovering areas of opportunity with our Small Business Group, eHealth led several initiatives to help create tools to allow our agents to be more efficient and to move the business online. First the process started with a deep dive research project that involved visiting small business owners in both Houston, Tx and San Francisco,CA to figure out how they thought about business insurance, how they researched it, if they had it it, and if they didn't why not. Small business owners with 2-10 employees in the health, tech and professional services sectors who either have health insurance, has provided before, or who plans on enrolling in the future. Presentation of findings, spreadsheet of findings stakeholders could use to parse through data easily, stakeholder persona workshop to create personas to use in product development. First round of designs created, then reviewed by key stakeholders for feedback. Reviewed by product, design, and engineering, and executed. Proposed designed tested in A/B setting to determine user feedback and if success metrics met. If not, review designs and revise based off learning. Redesign of old census page to improve UI, improve completion rate, and get more leads. 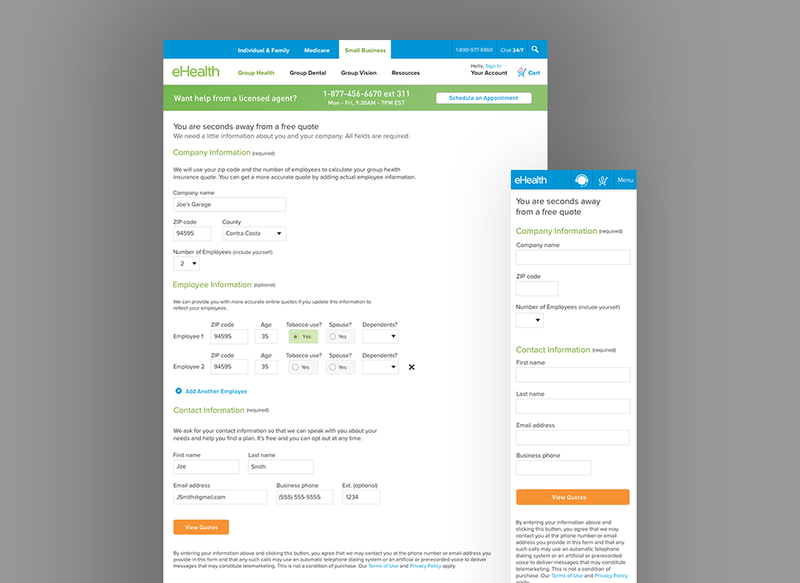 This design was set up to create the ability to turn on/off the requirement for leads and simplify the amount of information the user needed to input to get a quote.